I first came across this Andrea Reusing recipe on In Medias Recipe, my friend Carol ‘s blog full of beautiful photographs from the Santa Barbara farmers market and gorgeous dinners from her table. A skillet souffle is not unlike a frittata or Spanish tortilla, except for the genius inclusion of baking powder that puffs this pretty thing up in a tall, firm sliceable, pie that serves up in slices. I count on this dish, making it two or three times a month. Satisfying, refrigerator-clearing, easy to reheat, this dinner is on happy repeat. And the other thing. I’ve made it substantially larger. You see, we like this egg dish just as much the next day for breakfast or lunch, either wrapped in foil and reheated in the toaster oven or served up at room temperature. 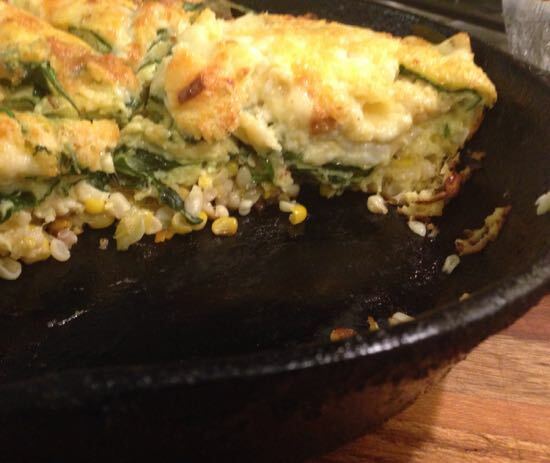 One 10″ skillet souffle feeds us dinner and another meal the next day. Out of the fridge, you’ll need a few eggs, something milky, all the kinds of cheese, onions of some sort. I dig out every vegetable, containers of leftover roasted veg, half a turnip, part of a cauliflower. Especially mushrooms. Consider these wonderful possibilities: broccoli (small florets), chiffonade of hearty greens like kale, collard, mustard, brussel sprouts (sliced very thin), carrots (julienned), winter squash (small dice), zucchini (grated) and so on. And there are so many meaty options. BBQ? Bacon? Italian Sausage? Chorizo? Shredded chicken. Have some shrimp? Cook any meaty addition thoroughly before adding it at the same time as the cheese and greens. Or use it as a garnish. See the possibilities? It’s a total sweep of the vegetable drawer, cheese drawer and little containers of dairy products. I’ll give you a recipe below for the skillet souffle we had this week, but don’t feel constrained by any of it. By the way, Skillet Souffle screams out for a condiment. Try Spicy Ketchup. Or Tomato Chutney. And relax. You can go to the store tomorrow. Beat the eggs with the milk and creme fraiche until frothy. Stir in the flour, salt, baking powder and cayenne. 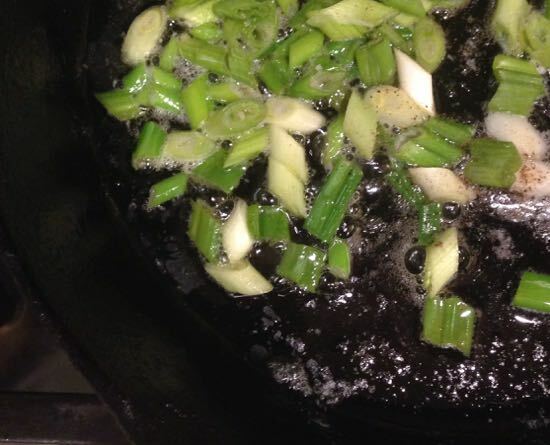 In a 10″ straight sided skillet (cast iron is great), heat the olive oil and butter until shimmering. Add the scallions and cook until they are just starting to wilt, about two minutes. 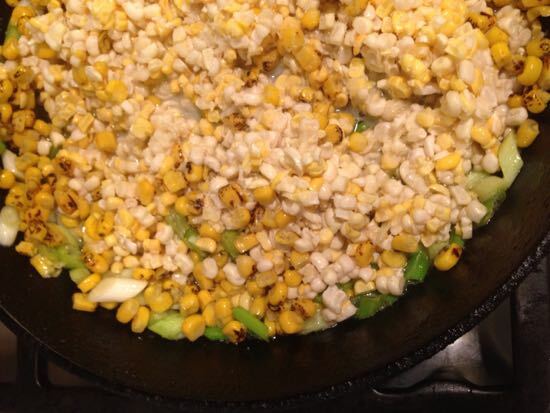 Add the corn and cook until it begins to brown on the edges and is just beginning to stick a little. Add the squash and stir. Add the butter (or bacon fat or duck fat or schmaltz) and get it really hot, the brush the fat up the sides of the skillet so the souffle won’t stick. Add the spinach. Pour the egg mixture over the veg, scatter cheese evenly around . Slide the skillet into the oven. Wait for beauty and happy times, about 25 minutes away. Don’t you love clean out the fridge options that are truly delicious. This looks lovely- can’t wait to try! Found you after listening to your interview w/ Evan on her KCRW food podcast. I really like your “approach” to food. So I know your book will a great addition to my cookbook shelf. 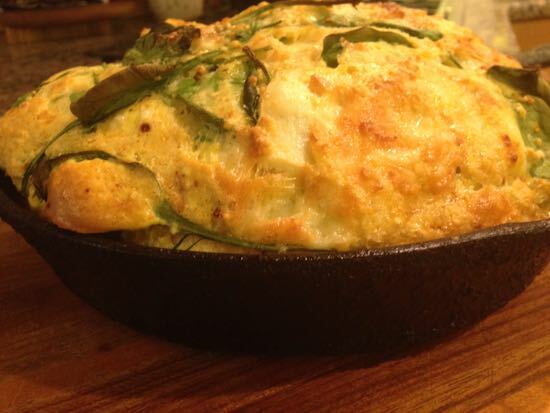 Skillet soufflé is on my “to do” list. Brilliant! My hubs loves quiche, but I’m not always in the mood to make pie crust. And my attempts at crustless quiche fell a little flat. Literally. Frittatas are nice, but a little dense. The flour and baking powder might be the trick here — kind of a savory dutch baby? Welcome, Carol! I’m so glad you’re here. Let me know how you do with the skillet souffle! Hi there- I found your writing through your article about pressure canning beans, and then, while waiting for my black bean batch to be done, I have been perusing your blog (so excellent!). This is my favorite kind of recipe. Curious if you have ever tried using duck eggs? I’ll be trying this soon, we raise ducks on our farm and I’m always on the look out for good duck egg recipes to share with our customers! Thanks! Yes! I just love the rich taste of duck eggs! I have some yellow squash, and one zucchini that ran amok… This will help use them up, along with some leftover bacon, and mushrooms and onions. Yum. Looking forward to supper tonight!